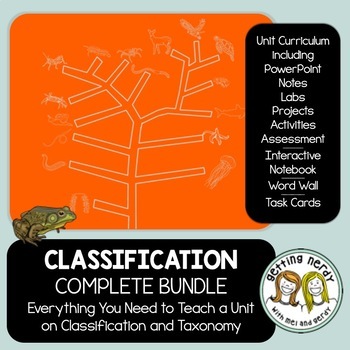 You're ready to teach with this comprehensive bundle for teaching Classification. Engage your students with our animated PowerPoints and aligned lessons, 30+ Interactive Notebook activities, a visual word wall with roots, suffixes and prefixes AND English and Spanish translations, and a set of versatile task cards aligned with the lessons taught in this unit. You're all set!